If you really want to be a writer then just do it. Just write. Don’t complain you’re running out of ideas. Don’t moan you’re always disturbed by noise around you. Don’t find any other excuse to validate your being slack in reinforcing self-discipline. Don’t ever feel intimidated by a fear phantom whispering that you’ll lose in the middle of the journey or neglected by the rest of the world after all the toil. Keep on moving forward. 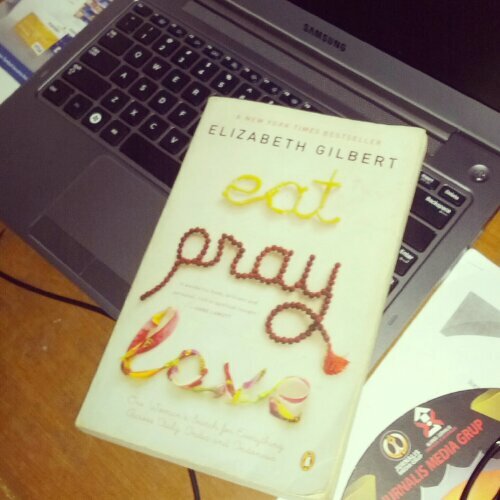 That is the core message I was trying to extract from Elizabeth Gilbert’s speech at TED in February 2009. She is the heroine I look up to in becoming a writer. I love books. I’ve longed for becoming a writer yet up to this very second feel like I’m a failure. Yes, I’ve been cognizant of languages for years academically but still I am not a published writer (with the self-publish online platform and a site I write at as exceptions). Not yet, on paper, on print. So what’s my problem? Does it have to do with my introverted personality? Perhaps. But then I read, a number of published, widely acknowledged authors too are introverted. Nothing is wrong with being an introvert but what is wrong is when it holds me back with my, I hope, lifetime pursuit: writing. As I look back and find where I am at the moment, I come to realize I actually am on the right track. I am not there just yet but only to see I’m now heading to the right direction is too good to be true. I am now in fact making a living with my linguistic skills. I write. I translate. And as a professional, I get paid for what I do. I definitely wish to earn more and more but that’s just another story of greed and ambition. I want that of course. A great deal of wealth. But I want myself to deserve the perks. I ought to earn it. Because that’s the essence of being a human. Strive, fall, or succeed, and learn from whatever lessons this life has to offer. Back to Gilbert inspirational speech at TED, I suppose the author made 2 critical, worth noting points anyone can learn writing wise. First, one should never be afraid to start because of failure risks. And second, one must never be intimidated by success. That is all. That’s what any human has to deal with every single day, isn’t that? If you’re nothing, you want to be someone. And after reaching the peak, you’ll wonder, “What’s next? Am I going to fall down right after this, soon or later?” The fear of being in the extreme state of adversity is overwhelming. Being in nadir is too terrifying an idea. The lowest point of anything which may trap you for good, sucking you deeper for sure just like quicksand. She then shifted to the discussion of the evolution of human thoughts on creativity. The blonde 40-year-old lady quickly summarized the change of perspectives in seeing creativity from ancient Greece and ancient Rome, who thought creative works are the works of daemons helping artists work, to Renaissance school of thought stating human beings as the axis of the universe. And she sided Renaissance, I guess at this point. As a writer, Gilbert admitted having routines. She had to “get up at the same time every day and sweat and labor and barrel through it really awkwardly”, as she put it. Afterwards she talked about how musician Tom Waits could maintain the creative process and the quality of his works without being dictated by the so-called inspiration sent by heaven to mortals, including artists. I love how Waits handled the musical ‘revelation’ he without warning received as driving down the street. “Do I look like I can write down a song right now? If you really want to exist, come back at a more opportune moment when I can take care of you. Otherwise, go bother somebody else today,” Gilbert was retelling what she heard during the interview with the musician. In Spain, she added, when a performer has done something impossible and magic,Allah, ole, ole, Allah, magnificent, bravo,” incomprehensible, there it is — a glimpse of God. “Which is great, because we need that,” Gilbert argued. At this point she turned spiritual. Lastly, the African dancer story ended with him becoming a mortal again, not a glimpse of God, by the next morning. This time no transcendent aura whatsoever found in his soul. The magic turned out to be a loan from the Unknown source. And this magic is to pass on to someone else when the dancer’s time was over.